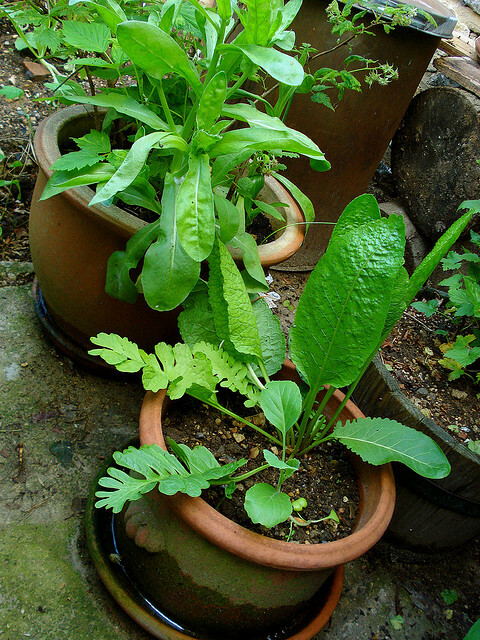 Horseradish (Amoracia rusticana) has been named the 2011 Herb of the Year by the International Herb Association. The usable part of the horseradish is the white root of the plant. Once planted the gardener will have a perennial supply of it! Even when I’m positive that I’ve relocated an entire plant, some tiny root will volunteer a new plant in its former location. If you choose to have it in your garden, put it in the back corner and harvest early and often for the most tender roots. Plant straight young roots 8-9 inches long and ½ inch wide with the crown about 5 inches under the soil line. These roots grow deep and love compost and manure. Although the literature notes that horseradish may be subject to pests and diseases, I have never had a problem. Harvesting can be done in spring or fall. If you plan to grate the roots, do it outdoors as the fumes are very, very potent. I clearly remember my great uncle sitting outside at his picnic table grating horseradish with tears running down his face. Today we can use a food processor with a grating blade, but it is still best to do it outdoors or in a very well ventilated location. Grated horseradish is wonderful with roast beef and is a staple ingredient in cocktail sauce for seafood. The Oracle at Delphi told Apollo that horseradish was worth its weight and gold, and American folklore says that it should be planted next to potatoes to protect them from disease. I LOVE horseradish and have been thinking about trying to grow it for years. Maybe I’ll grow it in a pot in the garden? Is it that invasive? It’s not really that invasive if you dig it up yearly for culinary use. The root, however, can become very large if untended for a few years. Case in point…I ignored one of the plants in my herb garden and the roots are so large that it’s pushing up the raised timber surrounding the bed! I’ll definitely move it to the back of the veggie garden soon and bless others with the cuttings. I imagine that growing it in a pot would somewhat contain its wandering spirit, but I haven’t tried it. I’ve had horseradish for years in two different gardens and have not found it to be invasive in the slightest. Though, when harvesting it, and you have the stuff in the blender, I recommend to do the blending outdoors. The smell is atomic! It is blinding.